Whether it’s in a cozy café or a comfortable restaurant, breakfast eateries across Connecticut are serving up some of the most delicious omelets you’ll ever bite into. With seemingly endless flavor and ingredient combinations, omelets are among the best breakfast foods—you never get bored of them! Whether you want a veggie-based omelet or an omelet packed with your favorite meats, these 12 great spots in the Nutmeg State are serving up the best! Order a specially made omelet for breakfast at Cosmic Omelet. Options include meaty delights such as the Three Pig Omelet with ham, bacon, sausage, and American cheese, or Miss Piggy’s Junk in the Trunk with barbecue pulled pork, onions, and cheddar. Slightly healthier options include the Green Giant with ham, broccoli, and cheddar, or a vegetarian omelet. All omelets are large, fluffy and super filling at Cosmic Omelet. Three egg omelet options abound at Mirsina’s with delicious flavor combinations on the menu or the option to create your own. Top favorites are the gyro omelet, which is stuffed with gyro meat, onions, and tomatoes, or the farmer’s omelet filled with bacon, ham, sausage, onions, peppers, mushrooms, and American cheese. Mirsina’s also has other breakfast options such as French toast, waffles, and pancakes. Enjoy a warm welcome and great service at this friendly neighborhood diner. Try the highly-rated pastrami, Swiss, and onion omelet and enjoy a winning combination. Many of the dishes incorporate locally sourced produce and specials often reflect what’s in season. A family-oriented restaurant rocking since 1966, Chip’s has earned itself a special place in the hearts of locals. Chip’s also has locations in Trumbull, Orange, Wethersfield, Southbury, and Southington. And their “delightful omelets” are a must-try. Guests are welcome to build their own, but be sure to try the “Chipper,” made with bacon, mushroom, avocado and cheddar cheese or the “California,” made with tomatoes, Bermuda onions, avocado, cheddar and Swiss cheese and a hint of garlic. With gluten-free options available at Ken’s, this is a great breakfast spot for those with gluten sensitivity or Celiac. The large number of omelet options on the menu are spot on and include unique flavors like lobster omelets. The large meal sizes will keep you full until dinner or even see you taking home leftovers! Head on over to Manchester for an American-Canadian breakfast feast. The menu features seven different omelet options as well as the option to create your own omelet. Omelets are inspired by Canadian dishes and include the Canadian omelet with Canadian bacon, onions, peppers, and cheese, or the Quebec omelet with mustard and cheese. They also serve delicious French toast as well as poutine. Another excellent choice for an omelet in Manchester is Center Perk with six options on the menu plus a wide selection of ingredients available to make your own combination. All omelets come with home fries and your choice of toast to make the meal even more filing. 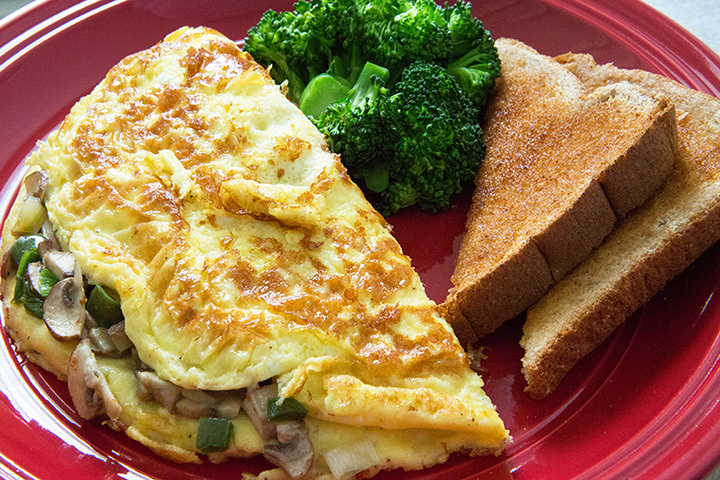 Add some spice to your morning with a Cajun omelet stuffed with spicy sausage, pepper jack cheese, mushrooms, onions, jalapenos, peppers, and more. Order up! Blackberry River has a wide selection of baked goods and breakfasts on offer and features a complete selection of omelets served with toast and home fries. The smoked salmon omelet with salmon, capers, and cream cheese is especially good as is the #9, which comes with homemade pesto, sliced tomatoes, and fresh mozzarella. Known as one of Connecticut’s best delis, Katz’s Deli also has a flavorful breakfast with options inspired by their deli lunch menu. The pastrami special omelet is packed with grilled pastrami, Swiss cheese, grilled onions, and tomatoes. Plain cheese omelets are also delicious and can feature melted American, Swiss, cheddar, mozzarella, or feta. The comfortable Paperback Café serves up delicious breakfasts from the heart of downtown Old Saybrook. They serve an array of breakfast items such as egg sandwiches, scrambles, sweet dishes, sides, and of course omelets. Create your own flavorful omelet from fillings such as peppers, mushrooms, bacon, sausage, and more or choose an omelet off their menu. The Italian omelet is particularly flavorful and is stuffed with mozzarella, chicken sausage, tomatoes, and baby spinach. Enjoy a filing meal while overlooking the green in Southington. The breakfast menu at Pepper Pot features a large menu of omelets served with home fries and toast. The house favorite is stuffed with spinach, tomatoes, and feta cheese, and the flavorful New Englander is a meat lover’s dream with bacon, ham, onion, baked beans, and cheddar.